BBQ offers an excellent system for administration of menu cards. Powered by a specially developed custom post type and a custom taxonomy you can easily organize your food and drink menu. For those curious customers you can set gluten free items, calories per serving, vegetarian and spiciness. BBQ comes packed with two different menu card templates. First, a stunning grid based menu card template. Second, an amazingly distributed list based menu card template that includes a floating selector. 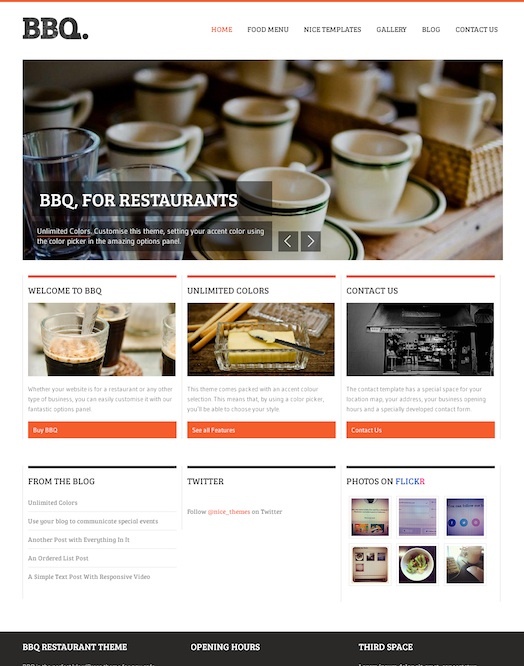 BBQ restaurant WordPress Theme also features opening hours, image food gallery, contacts template, social media icons and more.